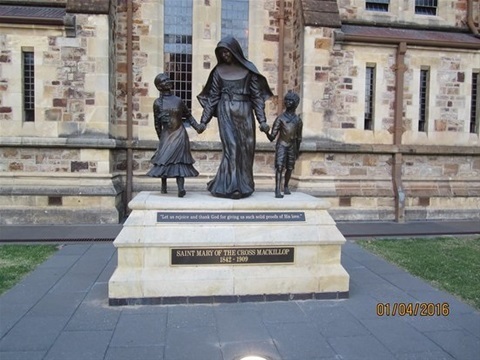 "Set your hearts on his kingdom first, and on God’s saving justice, and all these other things will be given you as well"
Although her parents were from Scotland, Mary MacKillop was born in Australia in 1842. She was the eldest of eight children and was well educated by her father. She is remembered for her eagerness to discover God's will in all things, for her charity in the face of calumny, and for her abiding trust in God's providence. Do all the good they could, and never see an evil without trying to remedy it. They lived very differently to us, don’t you think? The most important difference is that Mary and her Sisters tried to do the right thing, instead of doing what pleased them. God wants us always to do the right thing. The Sisters had set their hearts on God’s kingdom and on God’s saving justice so, instead of saying I will do what I want they would say I will do God’s will. How very different it was back then. For example, Jesus wants all grown ups to come to Church every Sunday. That is God’s will. That is the right thing to do but many grown-ups today say I will do what I want instead! It was never like that before. Now, you guys have to do the right thing by God as well. But because you are under your parents’ care, it is God’s will that you obey your parents! Oh boy! Do you see how different Mary MacKillop’s life was to ours? Mary MacKillop made it her joy to please God and discover God’s will in all things. The greatest lesson that she wants to teach us is to do what God wants; to do what is right and just no matter what, and NOT be led by our desire to do what we want. That leads to chaos and unhappiness, a whole bunch of excuses for our own naughty behaviour and blaming others for our own faults. The better choice is to do God’s will. God leads us to happiness, joy, love and ultimately to heaven. Please God, through the intercession of St Mary of the Cross may it be so in our school and parish community! Amen.